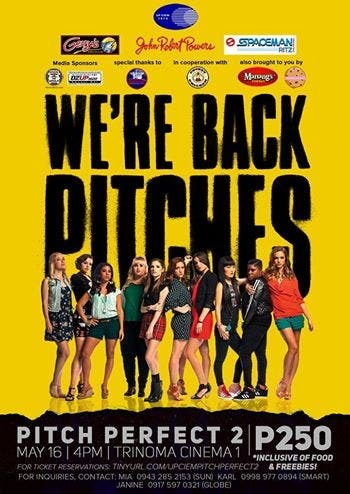 This coming saturday, you’re about to get pitch slapped as UP CIEM together with John Robert Powers, Gerry’s Grill, Monterozza Ritz Food Corporation bring you Pitch Perfect 2 — a special movie screening happening on May 16, 4pmat Trinoma Cinema 1. Tickets are available for only 250 pesos inclusive of food and freebies. What are you waiting for? Reserve your ticket now at tinyurl.com/upciempitchperfect2. This event is made possible by Chubby Chicken and also brought to you by Lemon Square, Sweetest Surprise Manila, Manang’s Chicken and Manila North Harbor with our media sponsors DZUP, WheninManila.com and Circuit Magazine.